I have hesitated to share too many resources here because a lot of what I do has been borrowed/translated/stolen from others and I use pictures from the internet without siting my sources... But I was encouraged to do so by my main teacher man Jeremy Jordan, who shares SO MUCH for free. A lot of these were done in haste, as I have five preps and only one prep period. So, if you see a typo or an error, please email me and let me know so that I can fix it! If you want to make changes for your class, just make a copy of the google document and go ahead! I know my students pretty well, so there are probably some things that I share with my students that you would not feel comfortable sharing with your students. For example, I show my kids Cyprien videos, even though he sometimes curses in French. Use anything all you want in your classes, but please don't sell anything and if you remember it came from me, a shout-out would be nice. If you see anything that came from you and want it sited, please let me know and I will be happy to add a HUGE shout-out for sharing. Daily info for the beginning of class PowerPoint: This is the best thing I added this year. It gives me a great opportunity to use some high-frequency structures that don't always come up in a natural story-asking day. It is a work in progress, as I usually add the slide the day before/morning of. My daily PowerPoints so far: This is how I organize my life. With 5 different classes, it's nice to have one place to go. I'm not sure if the sharing is on for every source, so if you click on something that doesn't work, let me know. Also, most of the things I do in French 4/5 were created by my colleagues Nicole and Caitlin (BIG SHOUT OUT!!!) and they may not want to share their work. Hope somebody finds this helpful. If not, oh well! I got nothing to lose! 1. FIND A SMALL, INTIMATE PLC: A few years ago, my friend Andrea Schweitzer and I started a weekly Skype session with Jeremy Jordan (who then abandoned us and was promptly replaced by Elicia Cardenas). These sessions are invaluable to my life as a TPRS/CI teacher. Just today, Elicia and I talked about classroom management, communicative ideas that our beginner students can use to communicate without spewing terrible French/Spanish, and supported each other through a couple of rough spots. I left our conversation feeling uplifted and ready for my next class. So, find someone (or a couple of someones) to meet virtually with NOW. 2. I will be presenting a session called "Time Saving Tips for the CI Classroom" on Saturday at 4:30. If you were going to attend my session, what would you want me to tell you? What would you hope to learn at such a session? I have a bunch of ideas, but I would love to hear of other ideas that I might not be thinking of. Away with the password at the door. I've done it for several years, but it just wasn't connecting. The kids weren't acquiring it. So instead, I'm going to use rejoinder posters during stories because I've had better luck getting them to use them at appropriate times and continue using them that way. But I'm still checking in with my kids at the door. I ask them a question that they should be able to answer with no problem. With my first and second year kids, that is something like "What's your name?" "Where do you come from?" "What grade are you in?" (from Special Person interviews). With my upper-level kids, I try to ask them something that is a bit more thought provoking. Some questions I've used this year, "Do you prefer your mom or your dad?" "What would you change about school?" "Who is your favorite visual artist?" I changed my rules from a huge list of what it takes to participate to Six Keys to Listening (taken from TPRS Books trainings) Look at me Involve yourself Show understanding Tune back in En français No talking over me It's very easy to figure out which "rule" is being broken. Party points and a brain break for every 8 minutes in French. We used our party points on Friday and the kids were way more excited for what we were doing. Maybe because they earned the time instead of begging for it? Breaking up La Personne Spéciale. It used to be my only plans for the first few weeks of school for French 1 and 2, but this year I am breaking it up with classic TPR and mini-stories. I got some great ideas for easy, introductory stories that could be told quickly from Tina Beard (a colleague from Kansas). It really makes class go quickly, I don't get as worn out, and the kids are more engaged. Starting class with a "date talk". I really don't know how everything in CI became a ____ talk, but I made a powerpoint with every day of the school year with a fun fact about that day. For example, August 21st was the day the Mona Lisa was stolen from the Louvre by an Italian patriot. I adapt my language for each class so that I use the same slide for every level, but the discussion is different for each level. Intentional planning for each hour. I know this seems like...duh!, but with 5 preps, I haven't exactly been the greatest at this in past years. So this year, I am trying to be very intentional with my planning, having ideas for brain breaks and switching activities several times to keep the students' attention. Those are some things that I've started doing, and, as we enter our third week of school, I'm pretty excited! I got a huge kick in the pants yesterday during a one-day workshop from TPRS Books (they offered it free of charge to a local district, which was kind enough to open it to any teachers in the area). Mike Coxon and Craig Sheehy were the presenters (full disclosure, I was there to be trained to become a trainer in the future). I think that this time of year is a great time to do a re-start (and probably would have been even better last month...but I'll take what I can get). I learned/was reminded of so much that I brought to the classroom today. First, I had gotten lazy about requiring choral responses and was losing kids because of it. So I started with that, saying, "When I say Classe, you say Oui! Classe? Oui! Classe? Oui!" Next, yesterday at training, Mike Coxon put me on the spot and said that he wanted to learn some subjunctive. Confession: I'm not good at it and I'm never sure if you do or don't use it with vouloir (to want)...but I went with it on the spot and then looked it up later. So, I had two actors. I started by saying, "Classe, il voulait que Shakira soit sa copine." Then I checked in with the actor, "Bart, est-ce que tu veux que Shakira soit ta copine?" "Est-ce que tu veux que Shakira soit ma copine?" Etc. So, today I decided to try it out in class. I had two actors: my first actor we talked about who she did/did not want to be her boyfriend. Second person, I told the class that I had a magic wand (and I pulled out my awesome hand-carved wand) and I need to find out what we wanted her to be able to do "Qu'est-ce qu'on veut qu'elle puisse faire?" In first hour, we decided that we wanted the actress to be able to transform into a tiger. So, I got out my wand, said my magic spell, cut the lights, and the actress disappeared (hid in the back of the room) and was replaced by a stuffed tiger. Hilarity! The third sentence was that I told my kids that I wanted that they all go to France with me next summer. "Je veux que vous alliez en France avec moi." It was great. My first hour was super into it and laughing and really playing the game well. And I was so impressed with how I was able to make the subjunctive seem useful and meaningful. Thanks Mike, for pushing me!! And, if I made mistakes with the subjunctive, please let me know because I am NOT great at explicit grammar instruction myself, so I can't figure this out on my own!! And there are only a few phrases that I have acquired and they don't always match up with what is useful to students. Edit: Since posting this, a couple of awesome-sauce teachers reached out to tell me that I had an error, which I have since fixed. If I ever make a mistake, I hope you all will tell me about it. And I will assume that it is coming from a place of love and not judgement. We're all in this together, right? Second thing that happened is that a lot of people said that we should just use the subjunctive when it comes up naturally. Absolutely. But, in my non-native speech, it hasn't been coming out naturally, so I need to force it a bit so it starts to become natural. Teaching TPRS has been the best thing I've ever done for my own French. Before teaching, "Il lui a dit" would NEVER have come out of my mouth on its own. But, because I forced myself to start using it in stories from the very beginning of French 1, it now falls out of my mouth as well as my students' mouths. So, in summary...YES, the subjunctive should not be "taught"...it should be used naturally. But I am forcing it a bit to make it work for me. Here are some videos that a student snuck. She thought she was soooo sneaky. But I was happy to have the video of a happy class and she agreed to share with me what she took. PS-I make mistakes. I'm not a superhuman. I hate watching myself. I cringe hearing the errors my French 3s make. BUT the love of the language and each other is there. I hope you can see it. Like I said in my last post, I was rushing to get through one timeline on the book so that I could prepare my kids for this day. There were a ton of activities that I could have done with my kids (student actors, parallel characters, snapshots, etc), but I chose to read it quickly and focus on making it fun since I didn't have to worry as much about comprehension. So, to start class, we read the first page together again, but this time, when we got to the choice, I told the students to move to a part of the room to make their choice. For this first choice, they all ended up back together again after splitting, so we read the next page together (where Bart listens to four people). Then, I had them go to the corner to choose a dog, cat, turtle, or piranha. I told them to read it with their group and raise their hand when they came to a choice. As this happened, I would split them into smaller and smaller groups. If a small group decided to stay together and read to an ending, I told them that they could continue on until they got to the end. By the end of the class, all students had come to another ending and you should have heard them excited to share their storyline! I have to tell you that Mike Coxon and Jeremy Jordan wrote a twisted, awesome story that really spoke to my students. The next time we had FVR, a large number of students chose to go back and read Bart a THIRD TIME!!!!!! This choose your own adventure is really magic. I can't wait for another one to come out. Thanks to Mike Coxon and all the people at TPRS Books, I got a classroom set of Bart veut un chat, which I (full disclosure) helped translate (and am still finding spelling errors in...I must have read that thing a million times and errors still snuck through). Mike asked me to teach it in my classes and let him know how it went. So, here's what I did. If you have any suggestions, please let me know!! I did this first with my French 2 kids because I knew we could whip through it quickly and I was proud to share the book with my students. We all started off on page one together. There wasn't anything too terribly interesting or difficult on page one, so I just read it quickly so we could get to the good stuff. With beginners, I think you could talk about what makes someone happy, who has a MacBook, etc. But I didn't want to drag this part out for my kids who have already acquired that language. When we got to the choice, I let students vote to choose where we went next. One class chose Coqui and we all turned to that page together. After we read the part about her having a Youtube famous cat, we talked about different famous cats. Grumpy Cat, Nyan Cat, and, my personal favorite: Keyboard Cat. I let them in on the secret that Coqui's cat was Keyboard Cat, and we watched this video. One class chose the parents, and we read that page and talked about chocolate. Then, we discussed whether pets can make you happy. Both choices end up with Bart talking to 4 people to decide which pet is the best. We decided that the veterinarian and the biology teacher were both experts in animals. After the biology teacher says that turtles are the best, we discussed that and someone brought up turtles eating strawberries, so we watched this clip. When I read the dentist's recommendation, I did so in a creepy voice because what she says is so out there. "Piranhas are the best because they can eat humans"?! Then, when we had read all the recommendations, we discussed which animal everyone thought was the best pet and why and I wrote up the ideas on the board. Then, we voted again. Sadly, both of my classes chose that he wanted a cat :( No imagination, these kids... When Bart searched for incredible cats on the internet, we did the same (I'm pretty comfortable with my kids and searching for things in front of them without fear of stumbling upon something that will get me in trouble...you may want to try this on your own first). The sad thing about this section is that one of the big jokes of the book is lost because it is supposed to say that there are NO cats at the library, but that got lost in the translation and the copy/paste of publishing. So I just told my kids that. 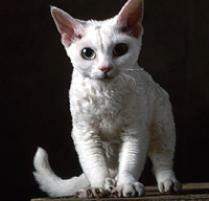 We talked about the different types of cats, and when we got to exotic cats, I had to look up pictures of the hairless cat (again, make sure safe search is on)...and then a student told me about the Devon Rex cat that he was getting that weekend. So then we had to look up videos of that cat. Anyway, then we chose where he went to look for the cat and the kids chose the cat cafe. Luckily, there was a vlog of a mom taking her two sons to a cat cafe in Paris. Some of my students had no idea what a cat cafe was, so this was a great introduction. I told them that they wouldn't be able to understand most of what was said, but to try and pick out one or two words and use visuals. On his way to the cat cafe, Bart meets a weird guy and we were able to use the conditional: What would you do? Would you talk to the guy? Would you run away? Etc. The kids chose to talk to the strange man. This page would be GREAT for acting out because the story gives the actors directions on how to act and what to do. I read through it and acted it out myself because I was trying to go quickly through the story. Next, my kids chose that Bart looks in the bag, and we find out that the cats had been tested, which brought us to a discussion on animal rights vs. human safety. We had a really deep conversation in basic French about who is more important, animals or humans? Of course we chose the strong cat and we ended our story quickly with the super ending, which I think was one of the fastest endings possible. END OF DAY ONE. I've been asked to share what I do in my class to help out some teachers feeling overwhelmed with a new method. I will say that, after years of teaching TPRS "off the cuff," I was fortunate enough to work in the same building as Jeremy Jordan, aka Senor Jordan, aka 2016 Missouri FL Teacher of the Year. I loved watching how his lessons built on one another so that the vocabulary was CONSTANTLY recycling. Ideally, all of our vocabulary would do this naturally, but I was struggling to make it happen. So, when Jeremy shared his year one and two lesson plans from last year here, I knew I had to look and see what I could steal...ahem...adapt for my classroom. Here is what I have so far. If it is helpful, I'm glad. If it's not, I'm sorry...if you have any ideas of ways to make it better, please let me know. If you see an error, for the love of god, PLEASE PLEASE send me an email at elisabeth dot hayles at lsr7 dot net so that I can correct it and get better at my own language skills. I have only actually used up to story seven in my classes...so this is not set in stone at this point.